The extent of violent crime in the farming community is hard to define without better data. By Johan Burger for ISS TODAY. Recently thousands of farmers, supporters and sympathisers took to South Africa’s streets in an emotional but peaceful protest against the violent attacks on and murders of those involved in farming. 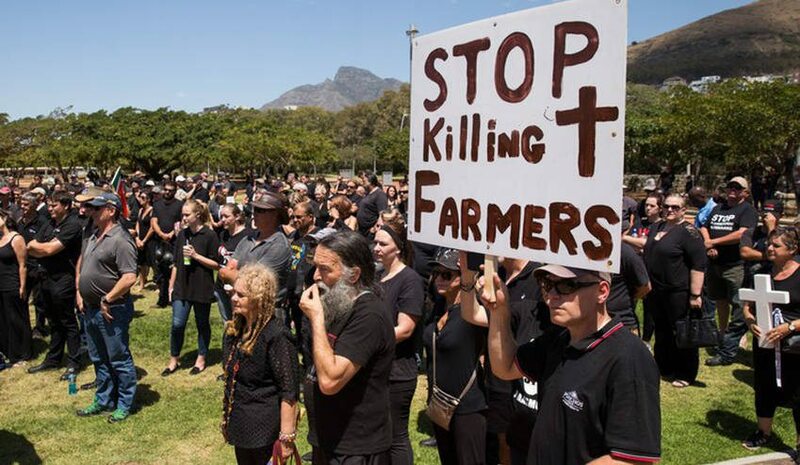 The protest action referred to as Black Monday originated from a call on social media by a friend of murdered Western Cape farmer Joubert Conradie for people to wear black on Monday 30 October 2017 in support of farm-attack victims. While the initiative had substantial support, much of the public debate was dominated by accusations that it was racist in nature. This was due to the display of the old South African flag by a small number of protesters. The phenomenon of fake news also raised its ugly head, apparently aimed at polarising public opinion further and distracting attention away from the impact of violent crime on those involved in farming. Violent crime is exceptionally high in South Africa and those who suffer the brunt of it typically live in poor and underdeveloped areas – evident in the extraordinarily high numbers of murders in places such as Nyanga, Inanda, Umlazi, Delft and Khayelitsha. We have also seen increases in the most serious and reliable violent crime categories of murder and aggravated robbery in the past five years. Since 2012 the number of murders has increased by 22% and the number of armed robberies by 40%. All provinces have experienced a rise in armed robberies with the rural provinces of Mpumalanga, North West, Northern Cape and the Free State recording some of the biggest increases. It is therefore not surprising that those involved in farming, commercial and otherwise will be negatively affected. Those living in rural areas, particularly in isolated areas, are particularly vulnerable to armed attacks where help may take long to arrive. In cities, criminals involved in home and business robberies generally leave the crime scene quickly as police and private security responses can be fast. In rural areas perpetrators are able to stay on the property for longer, and are then more likely and able to subject their victims to extreme forms of torture and brutality. Commercial farmers are well organised and have formed various agricultural unions, and so are better able to publicly draw attention to the way violent crime affects their sector. Because farmers are a relatively small minority in terms of numbers and are often seen to represent a particular sector of society, some people feel they’re drawing attention to their plight only and are unconcerned with what is happening in the larger society. The lack of government statistics on farm attacks and murders makes it hard to clearly define the extent of the problem. This can largely be blamed on the decision by the South African Police Service (SAPS) to cease publishing statistics on this phenomenon in 2006/7. Then in 2014, the SAPS made a submission to the SA Human Rights Commission hearings on safety in farming communities on farm attacks. Earlier this year, in reply to a question in Parliament, they also released the statistics for 2016/17 which revealed that for some undisclosed reason, while they have the data, they’re not releasing it regularly. The issue is further obscured by attempts to place a ratio on the risk that commercial farmers face compared to the national average. However Kate Wilkinson, in her analysis in Africa Check on 8 May 2017, points out some of the difficulties related to accurately calculating a ratio for farm murders, and for the murder of farmers in particular. This article was published in response to an article by this author in Africa Check in 2013, where a ratio for the murder of farmers was suggested as 120.3 per 100,000. This was arrived at by using the official statistics for farmers involved in commercial agriculture as found by the Statistics SA survey of 2007. Nevertheless, it is conceded that a ratio for “farmer murders” (as opposed to farm murders more generally) is also problematic since we really don’t know how many of the murdered farmers qualify as “commercial farmers” according to the criteria applied by Stats SA. Further research is under way. South Africa faces a serious threat with the crimes of murder and robbery. No one is immune from these types of crime and we must find a way to stand together to address this problem. Different strategies may be needed to address the various types of murder.